Mucosal atomizer devices improve administration of intranasal medications. Intranasal fentanyl 1.5 mcg/kg is a great way to give stronger pain medication (eg for fractures) without placing an IV. Intranasal midazolam 0.2 mg/kg (use concentrated 5mg/mL form to keep total volume < 1mL per nostril) can be used to treat active seizures when no IV access is yet obtained, or as an anxiolytic for procedures. Intranasal naloxone at a standard dose of 4 mg is being provided to opiate addicts to use in case of overdose. A commercial device is available, but currently some lots are being recalled (check here for recalled lots), or you may simply not have one in stock. Here’s how to make an improvised atomizer courtesy of Faisal Alghamdi of KFMC Riyadh. 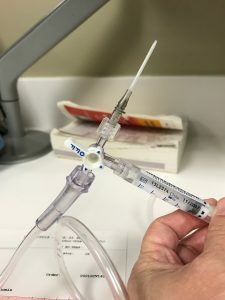 Hook up a 3 way stopcock with the lever turned so that all 3 ports are open to 1) a 14 or 16 gauge angiocath, 2) a syringe with the medication you wish to deliver, and 3) oxygen tubing. Hook the other end of the oxygen tubing up to oxygen and turn up to 5-10 L/min. Place the angiocath in the nostril and gently & slowly depress the plunger of the medication. See picture and video below.